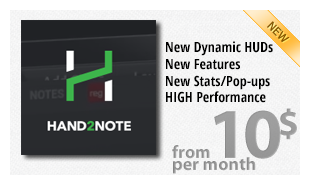 More than one and a half years of experience working with the statistics in HoldemManager2, NoteCaddy, Hand2Note and in creation and testing lots of stats (filters, definitions), we finally realized that can really help improve your understanding of the game and opponents. Pro.Tools Collections: Our team creates and actively developing an addons for Holdem Manager 2 and Hand2Note, providing turnkey solutions with the newest features. 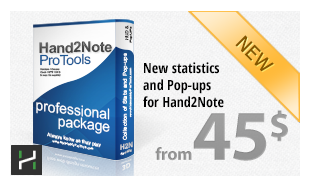 Hand2Note Pro.Tools: Professional collection of definitions/stats and pop-ups. This add-on to Notecaddy allows to better know and understand opponents with whom you play, and will improve your strategy by bringing it to a new level. 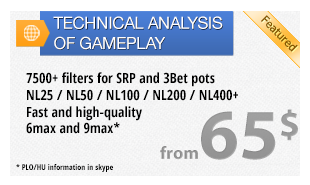 Database analysis: and Analysis of Players: This opportunity for new analysis of gameplay. Will help you to correct more quickly and effectively those situations that hinder to your fastest growth to limits.To use this service, it is necessary to send to us archive with played by you "hands" and after data handling, in 5-10 hours you will have a file report with the detailed list of leaks of your profit.